I hope you are enjoying this week as you climb up and slide down the hump today. Reading your blogs, it seems we all agree that January snuck away in the night when we weren't looking! I had to stop with that sentence and look up "snuck" versus "sneaked" because Mr. Blogger underlined snuck as if it were wrong. (How dare he!) Apparently it's okay to use either word, but snuck is considered an old-fashioned use of the word and sneaked is more modern. I use both, being the fence-sitter that I am. 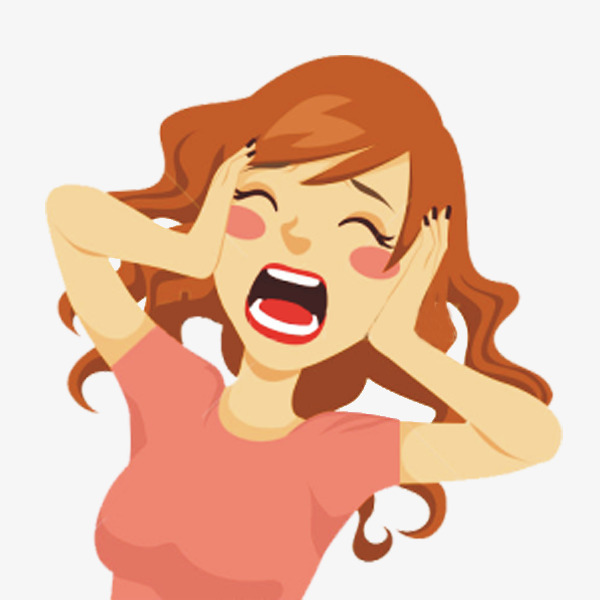 I find it amusing that I would normally use the words thusly: "He snuck out of the house to see his girlfriend," whereas, "She sneaked back into the house after seeing her boyfriend." Like a smarty-pants I combined the hugs and kisses usually used on Valentine cards with the sweet wishes and cupcakes usually used on birthday cards because I have a need for birthday cards on or near Valentine's Day. To add some zhoosh, I made the hugs and kisses rainbow colored. Also because The Card Concept had a rainbow-colored cupcake challenge, but sadly I see it has closed. Don't you hate that? Since I love puzzles, I had a blast piecing the colored bits into the white die cut border. Thankfully Hammy helped so it took half the time. The hugs and kisses die is from Memory Box and the cupcake and sediment stamps are from Penny Black's Sweet Wishes stamp set. I cut strips of matching snippets to add to the bottom and border of the card while Hammy winked the cupcake and glossified the cherry on top. Sorry about the shadow. It was late on a rainy day when the sun came out long enough to grab a shot. What's that you ask? What am I going to do with the dozens of left-over little colored hugs and kisses? Let's just say that if you receive one of these cards in the mail, you might want to open it over something other than your lunchtime soup bowl. Crafty Hazelnut's Patterned Paper Challenge: Anything goes w/ pp. Pixie's Snippets Playground: Anything goes w/ snippets. 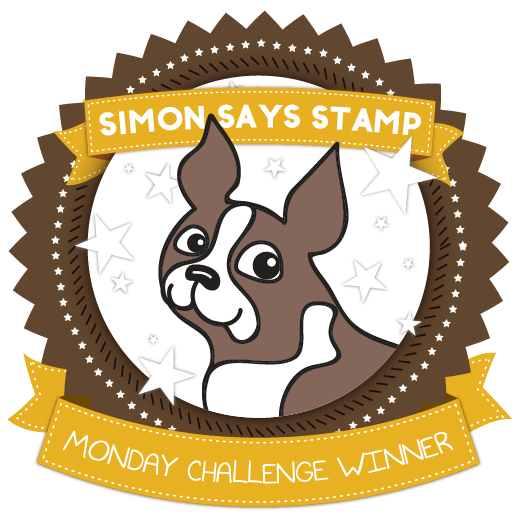 Simon Says Stamp Monday Challenge: Add some red. I have another snarky stamp to share, which I know just about everybody enjoys. And don't you love that pp? It reminds me of looking through a kaleidoscope. Sadly, I only had the one snippet, so I don't know the manufacturer. The ladies are Emerson stamps and the NBUS sediment is from Rubber Dance Stamps. The sediment says, "Oh, holy crap, they had an open bar!" For my CASE, I used a full panel pp for my background, a circle stage, and a cute image with a snarky comment. I know Jessi would approve! RIP, Jessi. You will be missed. 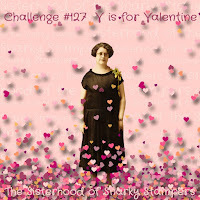 Sisterhood of Snarky Stampers: V is for Valentine. I know my card doesn't look like a traditional Valentine, but I'm sending it as a Valentine to a friend who will love it. Shopping Our Stash: Ode to Jessi. Love to Craft: Anything goes. Many of us who receive notification of our friends' blog posts via our mail inboxes are once again having problems receiving them. Many more of us are finding that we have been reverted back to being "no-reply bloggers" after fixing our settings to change that. It's so frustrating! You have prolly noticed that Blogger is doing away with Google+. I'm not sure if that's why things are getting discombobulated, but the only thing I can suggest you do is what I did: go back into your settings and remove your email address from the appropriate places, click save settings, and exit. Then go back to your dashboard again, re-enter your email address in the appropriate places, and click save settings again. This fix hasn't worked for all who have tried it, but it has worked for many others, so you have nothing to lose by trying it. Please don't ask me why it works for some and not others. I'm guessing it depends on what's the third from the last letter of the middle name of your grandfather's first cousin on his second cousin's side. I'm not setting out the full instructions here, but if you need help with where the appropriate place is for post notifications via email, let me know via my email which is listed on my profile page. Or you can use the Contact Me form in the salad bar on the right. If you need help with where the appropriate place is for correcting your no-reply blogger setting, you can click on the red Are You a No-Reply Blogger? label in the salad bar on the right. Morning Darnell.... well it is here anyway. Well I lost all the photos on my blog, so I have altered the blog a bit and deleted everything before this year. It was partly down to the Google+ thing, but also me not realising if I deleted them in the Archive, it would delete them on my blog as well. Not sure what happens now, as I do not have a Google+ account, but photos I put on my blog are still going into the archive. What a fantastic display of cards Darnell, I love the cupcake collection that you made using the scraps and the beautiful tribute card too. Cute cards Darnell! My daughter's birthday is on Valentine's day and she always got a heart shaped cake to celebrate. She's long outgrown that and now opts for a cake with fruit on top. Anyway, your card is the perfect combination of birthday and Valentine's day. I've been having issues with getting e-mails from friends blogs too. I'll give your suggestions a try. Thanks for sleuthing for all of us! I like snuck, snacks , sweets and snarky. The snarky card with the women cracks me up. Your comment about not opening a card from you over a soup bowl also cracked me up. 40 birthday and I thought how my heart would be breaking if this had been her. I'll be praying for her family. Darnell, Love the hugs and kisses. What a cool die. And what a fab birthday card for those near Valentines. So smart. And your extras are fun as well, loving all the colors. And the confetti...hah I had to laugh picturing that. YOur card for Jessi is perfect from what I have read. And that sentiment...fits my hubs to a tee. Sometimes I have to do a double take. And thanks for the blogger heads up...as usual you are the forefront of knowledge about the issues. I don't like sneaked...I like snuck. I don't like speeded I like sped. ITs all about sound for me. And my biggest peeve language wise is the demise of the ly adverb. For example it annoys the daylights out of me when I hear...don't take it so serious. Okay enough. Happy Hump day. I really enjoy your cards Darnell. Can you give me more info about the hugs and kisses die you indicated from Memory Box. I cannot find it on their website. Any info on where I can get one - those cards are terrific. I enjoyed your post this morning, I do love a snarky card LOL! I did get a notice on my blogger post page.......hmmmmm, I wish they would leave things alone, but I'll just have to jump through the hoops to keep blogging. I just hope they done hold those hoops to far off the ground, my feet have't left the earth, at the same time, in a very long time LOL! I too, have need of a birthday/valentine card, thanks for the inspiration for one. Love that you hopped right on the extra cards rather than handing them over to the BOB box! And that sentiment on the second is too much fun. Fabulous cards Darnell! I really love your writing style! And your cards too, of course. Love it when you give me several 'laugh out loud' moments, as you did with this entry. Such a great way to start my day. Thank you for sharing your abundant talent of bringing smiles and giggles to the day. Thanks for a few morning chuckles and your mini English lesson as well! Love your fun rainbow card and seeing that you didn't let those die cuts go to waste with your fabulous collection of cupcake wishes. 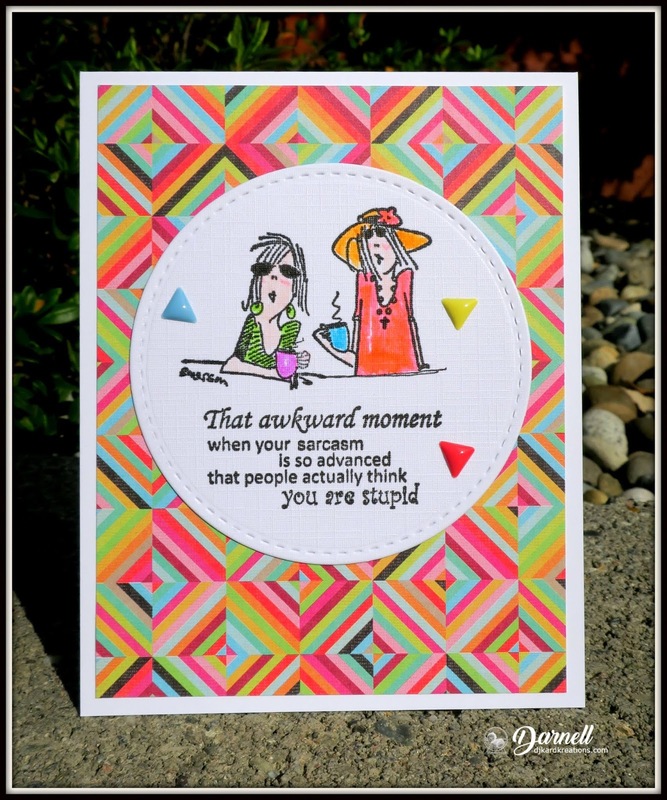 The snarky card is both fun and fabulous--super cool pp! So sorry to hear of the death of your friend though. And thanks for sharing her adorable card. What fun cards!Thanks for sharing and entertaining! Oh Darnell, you captured Jessi's sense of humor with this delightful card, love the pattern paper in the background and the fabulous and colorful girlfriends but that sentiment is a keeper!! Thank you for sharing this fun card CASEing Jessi's, I hope you come back and play with us next time. That was a great idea to combine valentines with birthday wishes, Darnell. Now that stamps have gone up in price, we need to save however we can. I LOVE that paper behind the snarky card. In fact I have a quilt partly done that looks similar. I snuck a peak at the new link and I think it will be helpful if people bother to look. I may send a few comments to some I know need this info. Such a darling set of cards, like the dimension of the XXOO's. Terrific tribute to Jessi...somewhere she's really appreciating it and it's hilarity. Wonderful way to remember friends. Clever use of that Memory Box die...I'm positive the recipients of the cards will be so pleased when they open them. You're a bit of devil, aren't you. Lots of sweet adorable cards Darnell. You have been busy. Hope all is going well for you. Love your cards, as usual! I'm having trouble getting into my blog, so I'll try what you suggested. It needs a major updating so it's very frustrating that I can't get into it! I'll be sliding over the hump day since it is freezing rain here. :o So while I stay inside, I'll admire your cards. I love the rainbow set of cupcake cards! Yummy cupcakes, bright and happy x&o's, and I really like the card layout as well. Of course I think your snarky card is terrific! Either you picked that fun paper first, or you are luckier than I am when it comes to matching already-coloured images. ;) Thanks for joining the fun at the Sisterhood of Snarky Stampers! Hi Darnell. A wonderfull gest from you to dedicate this post to Jessi. I hope some day someone will realize that all this bloggers improvements are not important. Thank you for all advices. Really cute cards. Thanks for joining us at Craftyhazelnuts patterned paper challenge. Happy crafting! this isn't Dennis, it is wifey, Mischelle. Love reading your blog, my husband helps out to with my crafting. Thank you for posting the words for your acronyms, CASE and such. I hadn't a clue. Nice, what you did to honor your friend. Take care, stay warm and creating. Wow, lots today! First, your cards are all just as fabulous as can be. I can hardly believe you cut and fit all those hugs and kisses, but now you have bunches of colorful cards which I know you need, plus all that confetti. Love the Emerson stamp and the snarky sentiment cracked me up. I really need to get busy with my snarky/funny sentiments. Interesting about the snuck/sneaked dilemma. 100 years ago I learned that the proper word is "sneaked", so I'm surprised to read "sneaked" is newly acceptable. Finally, Blogger... I think I'm okay so far. The Google+ issue might be causing problems. Sheesh, I don't know. If you see any problems with my comments or blog, please let me know. Your hugs and kisses have gone a long colorful way toward getting those February birthday cards done! I love both the positive and negative die cuts! Your kaleidoscope card is bright, snarky and fun! I'm having issues with my computer not just blogger. Your cards today all look delicious--even the snarky one! I love the idea of putting the die-cut bits inside the card. A nice surprise for the recipient. So kind of you to honor Jessi with your fun card. The background paper reminds me of the neon colors of the late 60s/early 70s. I use snuck, and sped, and mown (vs mowed). Yes, language is always changing, and some of us don't like it!! Just as I don't like it when something is advertised 'for free' instead simply free!!!! Love your cards Darnell, as yet I am not eating lunchtime soup so I would be safe :-)!! or at least as the postie arrives mid-morning here, my food would be safe. That snarky one is classic Emerson girls, and it sounds as though Jessi would have loved it! Glad to hear Hammy is earning his keep still. What a shame you missed that cupcake challenge... Fabulous cards Darnell and soooo colourful! I'm sure your friend Jessi would be thrilled that you made a card for her too.... As for blogger and Google.. I'm playing ostrich right now and hope to God everything works right... Have a lovely day! 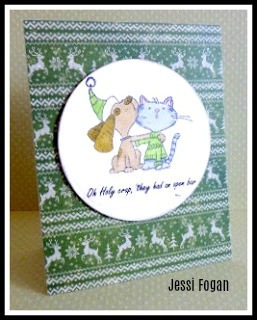 A lovely tribute to Jessi and such wonderful cards Darnell! I have a HUGE confession - I never knew what OXOXOXO meant! We have things called OXO cubes over here for making gravy stock and I always wondered why folk would want to send me those in a sign off! Sigh, knew I should have stayed in bed! Having said that - it's an amazing die and I adore how you've used it and then used up loads of resulting snippets as well. You do make me laugh with your hilarious posts my sweet friend! Psssst, forgot to say - I hope blogger is behvaing for you now. No-one responded did they - how odd, I think your Mr W the Stalker is maybe a fig tree of your imagination?! That is actually a joke as I saw his work for myself on your blog! Love blogger when it works - but it's a real oink oink when it plays up! I love your rainbow of pretty cards Darnell and how clever of you to make use of all your bits - it will be a great surprise for the recipients! I really like your snarky cards and this one makes a fitting CASE for Jessi. Hope you are well. I'm a bit shattered after caring for the delightful Alice today - I think we're both happy but utterly exhausted. Really cool cards, that hugs and kisses die seems so useful and a great way to use pieces and leftovers!! Amazing works also for the other card! Gotta love those rainbow cards! Brightens your day! Your card to honor Jessi is perfect! I was sad & surprised to hear of her death. Really love the beautiful BD cards--great use of all those BOBs, Darnell! These rainbow x's and o's are so happy and fun and the cupcake looks yummy. I didn't know Jessi but it's sad when one of our own passes. You card is a cute tribute to her. The paper makes me a bit woozy but it looks great on the card! I love the sentiment on her card. Hello Darnell! I love the set of five cards you made with the negative of the pretty pieces from your first card. So smart not to waist that paper and make a sweet set of cards. I am going to give that foil tip a try you mentioned on the Poppystamps blog, thanks. Such patience with your cards and loving the super cute XO die cuts. All so worth it as your cards are wonderful x. The snarky sentiment on the last card made me laugh out loud....thank you x. Thank you for your help on the blogger issues...I have been fussing with it for the past two days so hopefully everything has worked x.
X's and O's always look cute on cards for any occasion! Love the sweet cupcake and especially those colorful notecards! 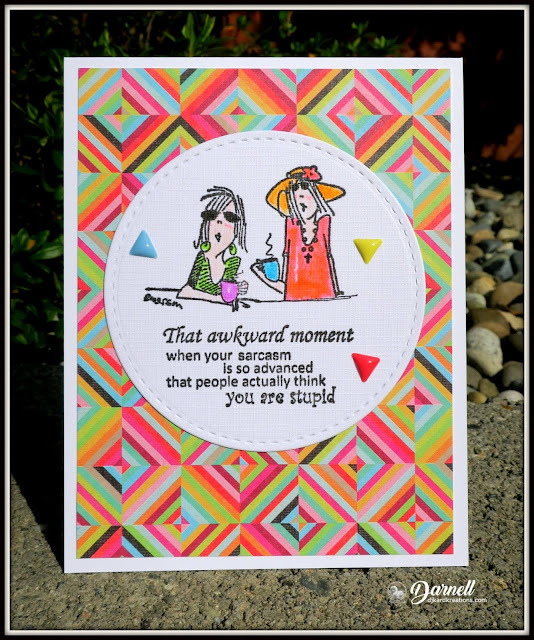 Of course I'm still snickering over the Karma card and now you've got another snarky one for me to chuckle over :) Love this one with those dazzling paper designs and colors! I still have some of those fabulous crocheted medallions Jessi sent me a long time ago and she was such a talented, fun person. She apparently had a difficult life from so many angles, but I'm sure she is finally smiling again in heaven where all her pain is gone. Fab projects as always Darnell! I don't think it is just January that has snuck away from me! February is well on its way too! before I know it it will be December again (dare I say!). I love all the bright colors on your cards. Thanks for joining the challenge at Love to Craft Challenge Blog. Darnell little late commenting on this card but just saw it over at Shopping Our Stash and had to come comment. I do so enjoy these stamps and this particular sentiment gave me a real chuckle. Love that kaleidoscope of colours too.